Layton’s book is a fresh voyage through a fascinating subject, bringing the feeling of sailing to the page. In Life at Sea: From Caravels to Cruise Ships, anthropologist Monique Layton relates her experiences on modern liners to the changes that have impacted sailing over time. It is a subject as vast as the sea itself, but Layton neatly ties diverse aspects together. 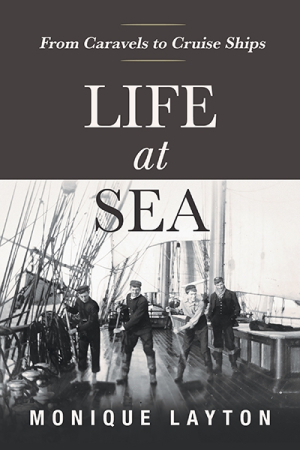 She provides detailed insight into just how much sailing has evolved—from the materials used to build and power ships, to the transport of passengers and cargo, to the pure entertainment and luxury of seafaring vessels. The volume offers a pleasant mix of genres, including history, science, and social studies. Although this is a work of nonfiction, the text reads like a novel because of its inclusion of snippets of spellbinding, little-known facts and tales about sailing. Melding all this together in a meaningful way while still managing to write concisely and to clearly organize the content, Layton offers a new way to look at the various types of sea vessels and their purposes. Using a vast number of sources, including statistics, research, and personal accounts, Layton evokes the feeling of being on a ship by providing a considerable amount of information in an intriguing way. Her own experiences and those of others provide support for the connections she proposes throughout the book. Notes on these references and sources are helpfully cited in detail at the end. By satisfying her own curiosity, Layton has pieced together a vibrant tale that puts a fresh spin on a subject that has fascinated civilizations for centuries. Those interested in history, travel, and sociology will find this book informative and riveting.